Serving such communities as Alachua, Archer, Gainesville, Hawthorne, High Springs, La Crosse, Micanopy, Newberry and Waldo within Florida’s Alachua county. 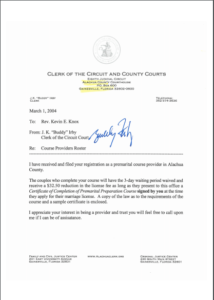 Click here for the Alachua County Marriage License web page to receive the most updated information on their hours, fees, forms of payment, ID that you would need, other possible documents and requirements. You can apply for your license by mail through the Brevard County courthouse without paying any additional fees. They request at least 30 days for processing. Neigboring counties: Bradford, Putnam, Marion, Levy, Columbia.